Emerald Isle Partners, LLC is a commerical real esate advisory firm located in Oakbrook Terrace, Illinois. Emerald provides intermediary and consulting services to real estate developers and owners looking to finance their respective projects and properties. 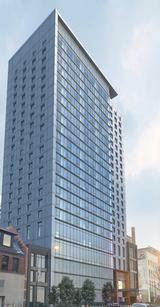 A 24-story dual branded 336-key hotel (210-key Hampton Inn, 126-key Homewood Suites) located in the West Loop.